I’m honored to show my art at the offices of California’s State Senator Scott Wiener, who is the author of SB 35, which will help California create more housing at all income levels. 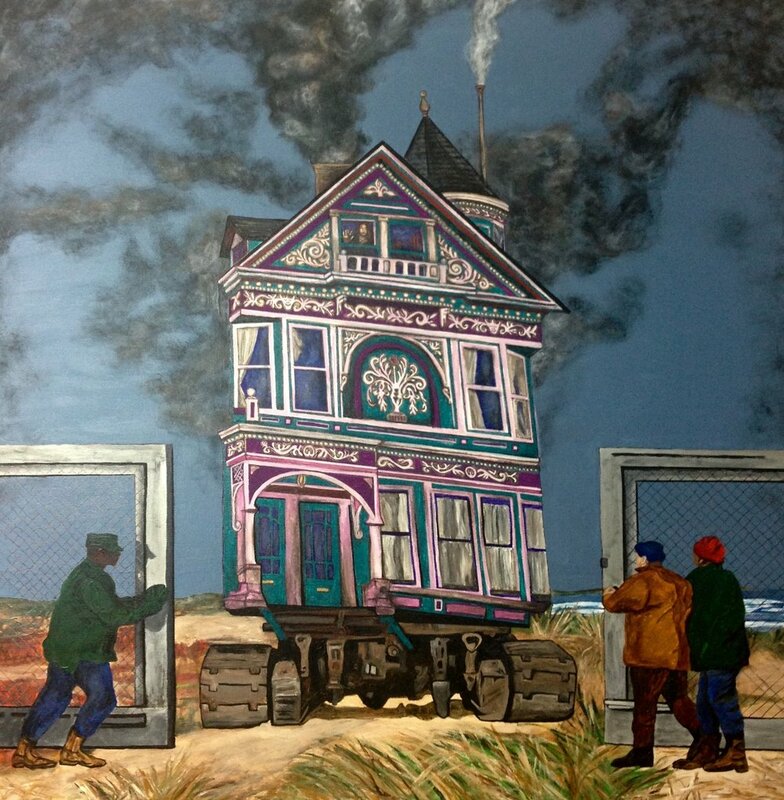 HOUSING is an exhibit by 18 Bay Area artists, that is looking at the meaning of this place we call home. My pieces are a statement on the housing crisis, which is pricing working families, millennials, seniors and vets out of the market for apartments and homes. I came up with a new angle on housing in San Francisco, by showing a future world with a different value system and pathway. The SS Jeremiah O’Brien became an innovative housing solution after the apocalypse. The “Liberty Ship” not only “gave space to live”, but it also “gave prospects to see”. People designed their own little paradise around the Haas-Lilienthal House. Giving a prospect means giving distance, and this is an engagement with the desires, and self-images of the beholder. The “new life” is starting on the horizon – just behind Land’s End. “Leaving San Francisco” refers to the contemporary evictions and forced removals, as well as the resistance of its residents. San Francisco becomes a restricted area, because nobody can afford to live there anymore. Victorian houses suddenly lose their value. Deportation orders threaten to evict Victorians and their residents. The window reflection reveals the displacement and struggle. The rising housing costs affect us all – not only people who got evicted or have fallen into homelessness. We are using far too much of our income to pay the rent or our mortgage. I wouldn’t call myself a starving artist, but it’s hard to survive as an artist in San Francisco. My current commute to work is about three hours, because I work all over the Bay Area and I cannot afford the accommodations to stay closer to the mural sites. Many of my friends are forced to live farther and farther away from their workplaces. This is clogging our freeways, which is reducing our life quality and is not good for our environment. Everybody should have access to an affordable place to live. With the signing of this new senate bill, I hope our government can successfully address the housing crisis and create a better housing future for all of us.